Pearl Roadshow drum kits are made for any level of drummer, beginner and professional alike, and any percussion style for any drummer who plays any genre. 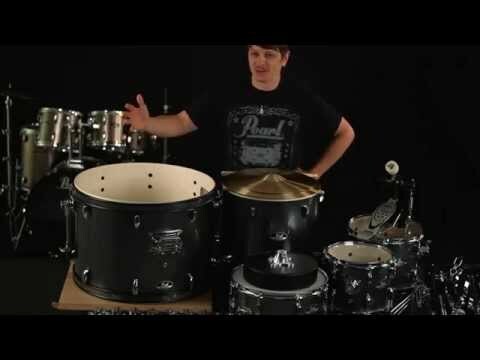 This is because the Pearl Roadshow is available in different configurations to suit your playing style. The Pearl Roadshow is a dynamic and versatile 5 piece drum kit, its 9-ply Poplar shells deliver a rich, resonant tone with excellent attack and projection. With cymbals, snare and hardware included, along with a drum throne, Maple sticks and a professional stick bag, this complete kit offers everything you need to start playing straight away. The Roadshow drum kits come fitted with dual-reinforced stands, height and angle adjustable and feature double-braced legs to withstand the pounding onslaught of the heavy-hitting drummer. Next to durable Hardware, Roadshow drum kits include Cymbals, Pro Drum Stick Bag and 2 pair of Maple 5A Sticks and a throne. They are available in a choice of three beautiful finishes: Jet Black, Red Wine and Bronze Metallic. These Pearl Roadshow 5-piece drum kit series come with basically everything you need to start drumming as soon as the package hits your doorstep. We have a great range of Pearl Roadshow drum kits along with many other Pearl series percussion products in stock ready to buy at Footesmusic.